Brad Widdup modestly says “it’s only a number”. But the Hawkesbury horseman can be extremely proud of his achievement of notching 50 winners in his first full season of training. Widdup reached the half-century at Canberra last Friday when his improving young sprinter Boyer ($3.70) won the Benchmark 65 Handicap (1206m) on the ACTON (synthetic) track to post his third victory from only seven starts. Aptly, his Chinese apprentice Qin Yong had the mount as Boyer gamely held out another Hawkesbury representative, Scott Singleton’s $3.30 favourite Alastriona. Widdup began training in April last year when prominent owner Damion Flower lured him to set up shop as a public trainer at his magnificent Platinum Park facility adjoining Hawkesbury racecourse. He was an instant success, scoring with his very first runner – Junglized, ridden by his brother-in-law Christian Reith, on Canberra’s synthetic track on May 26 last year. Widdup won five races from only 15 starters in just over the last two months of last season, and he has prepared 50 winners and 70 placegetters from 247 starters as the current season nears an end. He made a stakes breakthrough when Sandbar (raced by Flower’s Jadeskye Racing) won the Listed Lonhro Plate at Warwick Farm in February, and the same youngster gave him his first Golden Slipper representative the following month. Still, Widdup admits the early days were a little daunting after spending nearly a decade in a foreman/assistant trainer role at Crown Lodge, later Darley and now Godolphin. “I had been used to having 100 horses in my care,” he said today. “It was a lot different starting off with about one-tenth of that number, but Damion kept telling me not to worry and that it would all happen. Even when I went to my first yearling sale with him, I was blown away by the support he gave me and continues to do so. On Boyer, Widdup said the lightly-raced rising four-year-old had made good progress - he is unbeaten at all three Canberra starts (one on the course proper and the other two on the ACTON track) – and was nearing the end of his current campaign. A $180,000 purchase by Flower at the 2016 NZ Select yearling sale, Boyer is by Power, who won five (including two Group 1s) of his nine starts when trained by Irish wizard Aidan O’Brien and will stand the next season at Oaklands Stud on Queensland’s Darling Downs. 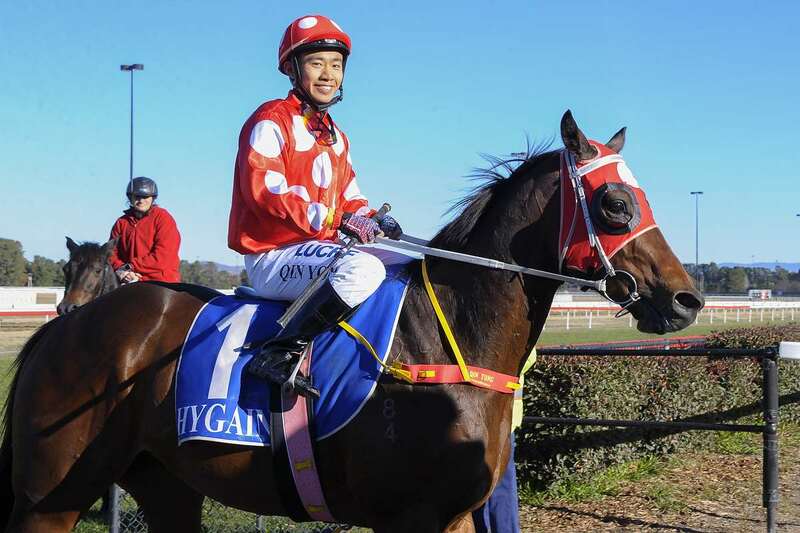 Widdup also was effusive in his praise of his apprentice Qin Yong, who left his wife and child in China last year to further his career in Australia: “Boyer was his 15th winner since his coming here (his first was Azzie’s Ready at the Wellington Boot meeting on April 8), and full credit to him,” he said. “He has been travelling all over the countryside to get a lot of rides under his belt. Widdup and Qin Yong’s 2017-18 trot is not over with Contemplate ($1.75 fav) winning race 1 at Bathurst today. Meanwhile, Widdup’s Sandbar, spelled after his Golden Slipper eighth to Estijaab at Rosehill Gardens in March, won a 798m Warwick Farm trial on July 20, beating another Slipper runner Santos, who finished 13th after winning both previous starts at Randwick. He will gallop between races at Warwick Farm on Wednesday and resume in the Listed The Rosebud (1100m) at Rosehill on Saturday week. Fellow Hawkesbury trainer Wade Slinkard also continued his excellent form by scoring with hotpot Stradazzle at Gosford on Saturday. The $1.50 favourite, with Josh Adams aboard, was too strong for his four rivals in the Benchmark 65 Handicap (2600m). It was Stradazzle’s sixth victory, and they have been between 1800m and 2700m. Slinkard recently won three races on the trot over 1300m and 1400m (twice) – all at home at Hawkesbury - with another six-year-old Legistation. The Boyer and Stradazzle victories lifted the number of Hawkesbury winners since 1 January to 120.